Although happily married couples may feel driven to distraction at times by their partner's personality flaws, they feel that the person they married is worthy of honor and respect. When this sense is completely missing from a marriage, the relationship has a very hard mountain to climb towards being revived. If your marriage is now in deep trouble, you're not likely to elicit much praise on each other's behalf by asking about the current state of affairs. But by focusing on your past, you can often detect embers of positive feelings. By reminding yourself of your spouse's positive qualities - even as you grapple with each other's flaws - you can prevent a happy marriage from deteriorating. The simple reason is that fondness and admiration are antidotes for contempt. 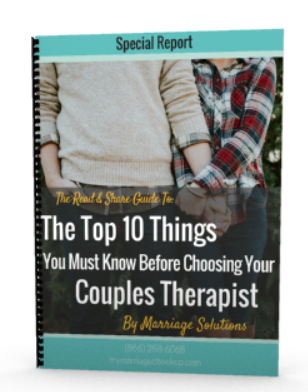 In marriage counseling you will learn how to improve this part of your marriage and protect yourself from negative influences.